Since 1993 the Tutor/Mentor Connection has been maintaining a list of Chicago area non-school tutoring and/or mentoring organizations and sharing this using a searchable map-based directory. Since 2010 the funds to survey programs and update the database, or to update the interactive directory, have not been available. 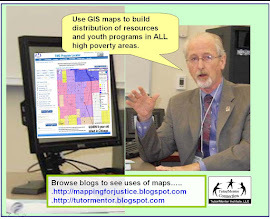 Thus the search feature and interactive maps on the Tutor/Mentor Program Locator serve more as a model of what we should be doing, than a reliable resource. During January 2016 I've gone through the web sites of every program listed in the Chicago Program Links to update addresses and web sites on my data base. I've used this to create a new map, shown below, that shows locations of tutoring and/or mentoring programs in the Chicago region. If you compare this map to the Program Locator maps you'll see many differences. a) there are no overlays showing indicators of need for tutor/mentor programs (poverty, poor schools, etc. ); b) you can't sort by age group served or type of program; c) you can't double click and go straight to the web site; d) you can't build maps showing assets (business, faith groups. However, you can zoom in or out and see what organizations are serving the same neighborhood. This can be used to build collaborations and/or for donors, volunteers and/or parents to search for programs in different parts of the city. Some of the locations on this map (and the Program Locator maps) are headquarters sites of organizations that offer community based mentoring (mentors meet with kids at different places), or are organizations with many different sites where they offer services. Big Brothers/Big Sisters of Metropolitan Chicago and Working in the Schools (WITS) are two who fit these descriptions. You'd need to go to their web sites to see their lists showing locations where they are active. In this section and this section of the Tutor/Mentor Institute, LLC Planning Wiki you can read goals for building a map-based tutor/mentor program database. Such a service can be applied in any city to support the growth of needed services in all high poverty areas, thus volunteers, partners and financial support can come from any place to help this work become a reality. Until then, I'll keep looking at low-cost platforms like MapAList.com to find ways to show who is operating in different parts of Chicago.